What’s aged for 18-months, made with 100% Canadian milk, and Non-GMO Project Verified? 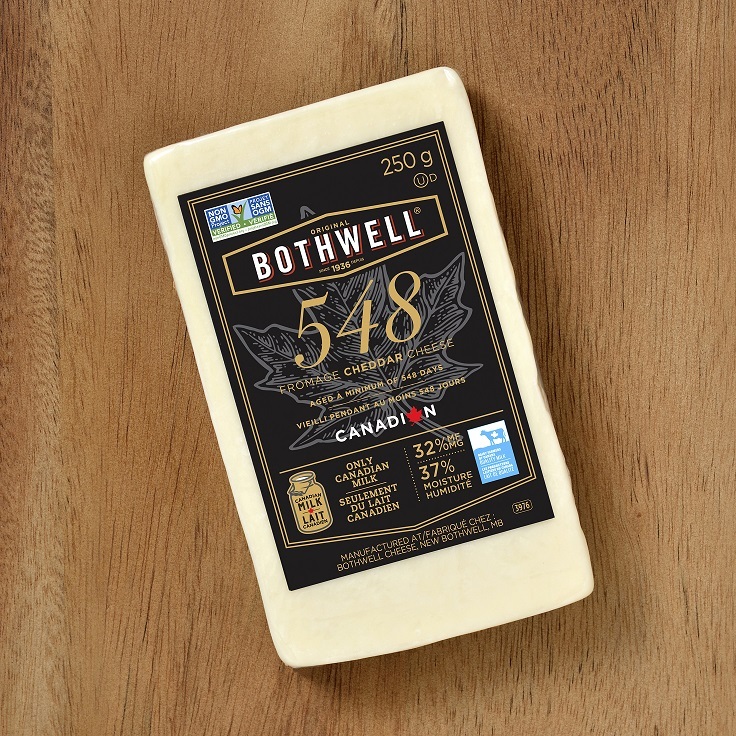 Bothwell’s brand NEW 548 White Cheddar cheese! We are so excited to introduce you to the newest member of the Bothwell Cheese family of Non-GMO Product Verified White Cheddar cheeses. This premium-quality cheese may possibly be one of our best Cheddars yet! It has a sharp flavour with a melt-in-your-mouth creamy texture. 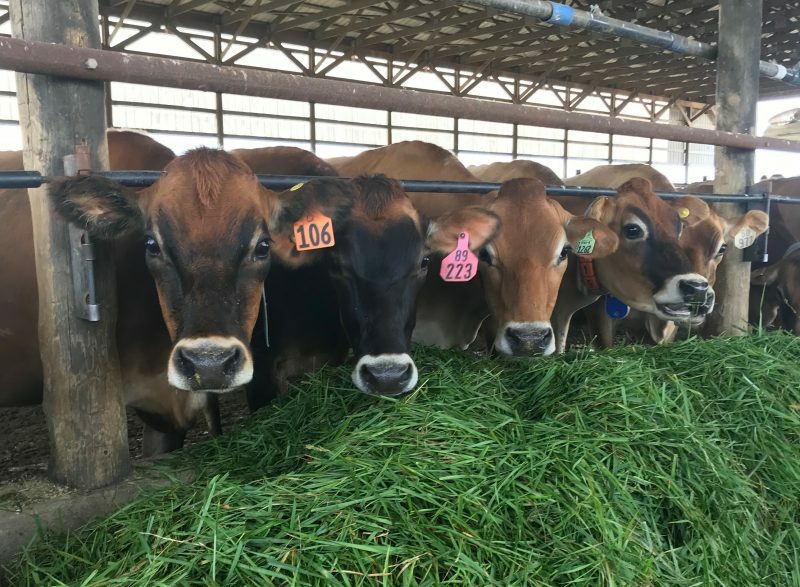 In order to make an award-winning aged cheddar cheese, with the Non-GMO Project Verified seal, the milk must come from cows that are fed Non-GMO verified feed. The crops grown on the farm are tested during harvest, if feed is purchased, it is tested upon arrival at the farm. There are three Manitoba dairy farms that supply the milk to create our Non-GMO Project Veriied White Cheddar cheese. These farms are located within a 20 kilometre radius of the Bothwell Cheese factory. Braunsdale Holsteins is a farm located near Blumenort, Manitoba, approximately 10 kilometres from the Bothwell Cheese factory. Just over three years ago, Greg started growing Non-GMO verified crops on his farm. We think he’s happy with the change! The Nyhof Farm is located near Île des Chênes, Manitoba, approximately 15 kilometres from the Bothwell Cheese factory. This family is the seventh-generation of dairy farmers. Albert (centre) along with his wife Willy Nyhof (not pictured) and their two sons, John (left) and Henry (right) traveled to Canada from Holland in 1993. 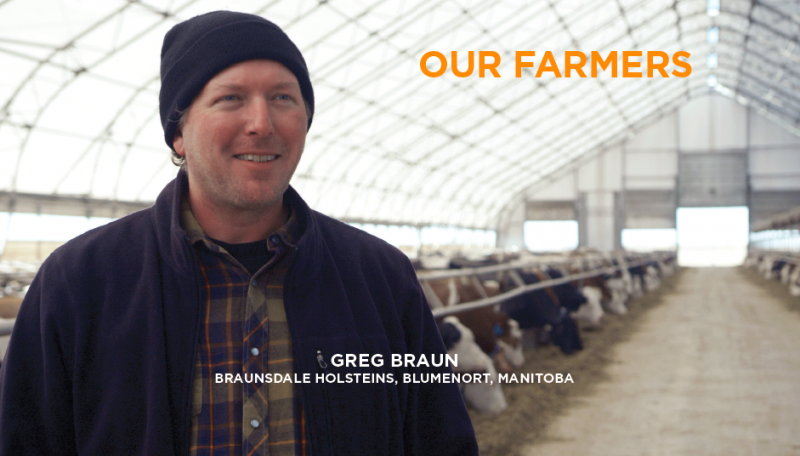 Together with their families, they grow Non-GMO verified grass, corn, and alfalfa during Manitoba’s summer months. 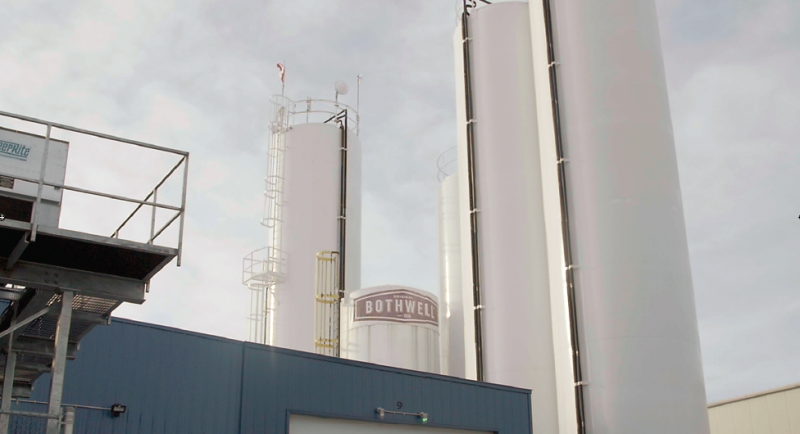 They are equally enthusiastic about the fact that they are one of three farms who supply their milk to make Bothwell’s Non-GMO Project Verified cheese. “It’s exciting for us to see this cheese being sold across Canada and to realize that this milk is coming from our farm,” says Henry Nyhof. Last, but certainly not least, we introduce the third farm that supplies the milk for our Non-GMO Project Verified cheeses, Four Oak Farm, Kleefeld, Manitoba. 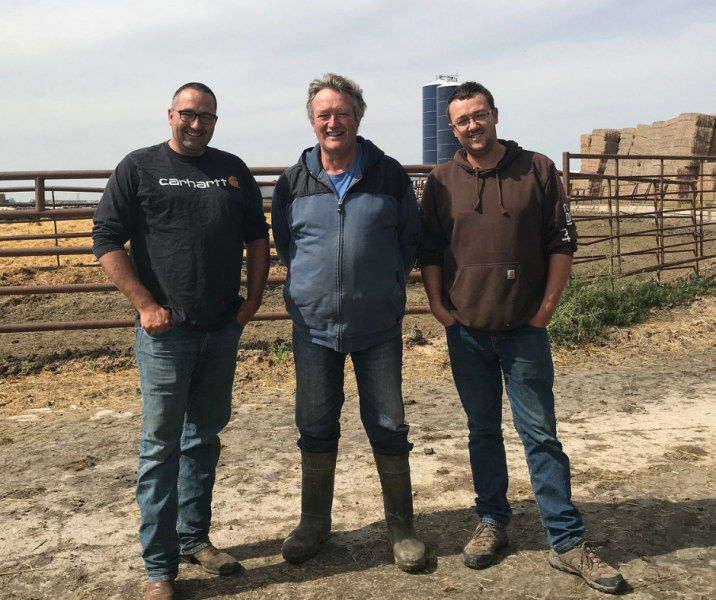 Located in the dairy belt of Manitoba, Marcus and Paige Dueck took over managing the farm in 2009 from Marcus’s grandparents, Hermann and Irma Dueck. 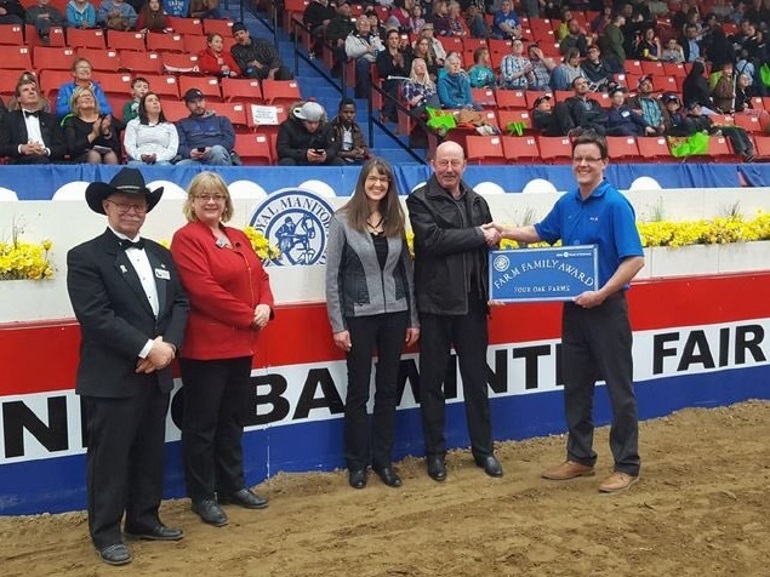 Their high standard of farming was recognized at the 111th Royal Manitoba Winter Fair in Brandon, Manitoba, where they were named the 2018 BMO Farm Family, as reported by Steinbach Online. All three of Bothwell’s Non-GMO Project Verified cheeses (shown below) are now available at Sobeys stores across Canada. Click here to find a Sobeys store near you. Click here for a list of other retailers across Canada who carry our Non-GMO Project Verified White Cheddar Cheeses. Thanks for letting us know. It’s great to source locally and support our community. Thank you for providing so many good quality kosher cheeses.